(August 12, 2015, The Condor: Ornithological Applications)—Eastern North America is home to a small population of Golden Eagles (Aquila chrysaetos), but despite their potential vulnerability to habitat loss and other threats, little information has been available on the patterns of their annual migration. One big question is whether or not they exhibit “migratory connectivity,” where individuals from the same breeding area also migrate to the same wintering area; strong connectivity means that a population is divided into small subpopulations that are especially vulnerable to environmental changes. For a study forthcoming in The Condor: Ornithological Applications, authors David Nelson of the University of Maryland Center for Environmental Science, Todd Katzner of the U.S. Geological Survey (formerly West Virginia University), and colleagues traced individual eagles’ movements through isotopes in their feathers to identify their breeding areas and to assess the population’s migratory connectivity. They found that eastern Golden Eagles exhibit a moderate degree of what’s known as “leapfrog migration”: the birds that bred farthest north also spent the winter farthest south, “leapfrogging” over others in the middle. Between 2006 and 2014, Nelson, Katzner, and their colleagues trapped 42 migrating and wintering eagles, outfitted them with GPS trackers, and collected feather samples from those same birds. Different geographic areas have different proportions of hydrogen isotopes in their water, and by analyzing the isotopes in the eagles’ feathers, the researchers were able to match them to the areas where they were eating and drinking when their feathers formed and thereby determine their summer ranges. Data from the GPS units helped confirm that the conclusions they drew from feather isotopes were accurate. The study’s authors suspect that the leapfrog pattern they found could be due to a tradeoff between the favorability of southern breeding locations and the harshness of northern wintering locations. The pattern means that different groups of eagles are likely to be vulnerable to different threats—for example, eagles that summer in southern Canada also winter primarily in the northeastern Appalachian Mountains, where increasing numbers of new wind energy facilities are being built. 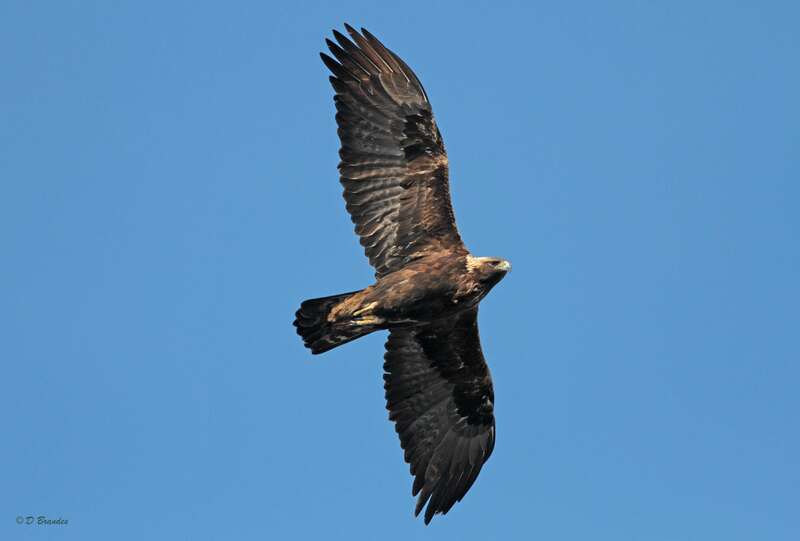 Stable hydrogen isotopes identify leapfrog migration, degree of connectivity, and summer distribution of Golden Eagles in eastern North America is available at http://www.aoucospubs.org/doi/full/10.1650/CONDOR-14-209.1. Contact: David Nelson, dnelson@umces.edu; Todd Katzner, tkatzner@usgs.gov.